John Williams is frequently asked whether he is a stand-up comic: his facilitation style is relaxed, full of humour, and should really be classed as ‘edu-tainment’. Yet beneath his sense of fun is a laser-like ability to take participants on the journey best suited to their learning needs. 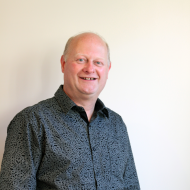 In his 20 years as a self-employed educator, John has honed his ‘in the moment’ facilitation, which is perfect for adult and youth audiences alike. Inspiration is what brings your business to life. The spark of inspiration is the reason you get up in the morning. It’s the reason you face challenges head-on and persist when all you want to do is quit. Without inspiration, goals are emotionless, business plans are lifeless, and teamwork becomes a nine-to-five drag. You could have the world’s best strategy—a real game changer—but without inspiration it is static. The two elements seem at first glance like polar opposites, where in fact blending strategy and inspiration is completely natural. Add a pinch of fizz to the plan and you end up with a team on fire, infused with a culture of innovation and respect, and you wind up doing far more with far less. As kick-arse facilitators with a knack for connecting the dots within a company, team or project, we have turned traditional ‘team building’ on its head. Your sustainable success is our focus. A tailored, structured programme is our speciality. Your outcomes will have strength and longevity. We work with other consultants as happily as with clients directly. We are not afraid to evoke emotion, realisation, and connection, and are on a mission to ensure more people are inspired at work. Want to come and play? If you have a team that wants to improve their performance, is working in a silo, or is quite simply stuck in a rut, we can help you reinforce the strategy, dust off the inspiration and bring your team to life.